Arsenal midfielder Mateo Guendouzi has confirmed that Paris Saint-Germain were among the clubs vying for his signature in the previous transfer window. The France youth international only joined the Gunners from Lorient in a surprise deal during the summer but he has since been a good success at the heart of the club's midfield. Speaking to Canal Football club, Guendouzi has acknowledged that Les Parisiens made an attempt to sign him but his mind was set on joining the north London giants. "It is true that PSG were very interested, like other teams, there were a lot of discussions, but for me the best decision I could make was to join Arsenal," he said. The teenager added that manager Unai Emery was equally influential towards luring him to the Emirates Stadium after assuring regular first-team football during his maiden season with the Gunners. 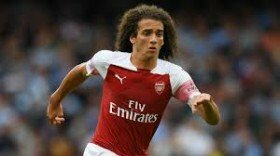 Guendouzi has started the previous two Premier League matches for the Gunners and he could feature once more when they entertain Qarabag in the Europa League on Thursday night.